90 day mission designed cheep and quick lasted 15 years. Now that is getting your money's worth. I asked one of the JPL Rover scientist at an JPL open house (couple years into the mission) why they didn't put a method of cleaning off some of the dust from the panels. He said because the project was only intended and expected to last 90 days so they couldn't justify the extra money required for the design, but had they known it was going to work so well they would have. 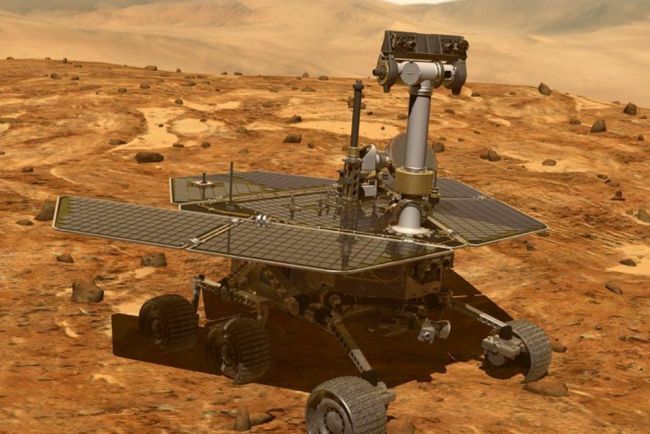 What I don't understand is, the design was solid, reliable and very cheep (compared to the Curiosity, 2020 rover and the 3 landers). Why didn't they mass produce another 20 of them with only slight modifications and send them to both Mars and the Moon. Instead they spent BILLIONS on design of an entirely new over priced rover Curiosity (which came in over budget and behind schedule) then mostly started a new custom build of the 2020 rover (also over priced and most likely behind schedule and over budget). I have been following the rovers, landers and satellites exploring Mars for over 20 years now. It's very frustrating to watch a slow motion exploration of another planet knowing we could have done it faster, better, cheaper, and with far more interesting results than we have so far. That frustration doesn't even take into account the frustration of watching and reading about efforts to put humans on the planet. Other than the rocket advances of SpaceX and Blue Origin we have done virtually nothing to prepare the tech needed to build a habitat and support a habitat on the planet. We still plan on living in the dinky little lander that will deliver the astronaut to the surface. Wow, now that is some great insight, thanks for sharing! Thanks MasterV... Yeah that seems to be the way of things, sadly. They don't get the budget they need for all the ideas and these people who make them are bound by too many rules, I imagine. and they and many others are bound my making more money by the "design[ing] of an entirely new over priced rover Curiosity"
@MASTERV Get a job at SpaceX! Private industry would have done what you recommend. Elon needs to find that perfect spot to start his Mars colony, and rovers, etc would do that. If they should be made smaller, or able to pack into a small space, so many could be launched in 1 rocket, and deploy a kind of hive of rovers, Im sure Elon would bite.